So you’re thinking, hmmm this social media thing just isn’t going away and maybe there’s actually something to it? Well, lets take a look at how the face of the average Facebook user is currently tracking… It has actually shifted over the past few years. While the Facebook population continues to grow, its total users have started to represent the worlds population more closely, but right now Facebook is in the middle of a shift from a college crowd demographic to a more eclectic one. The fastest growing demographic is the 35-54 year olds, which have a growth rate of 276%. The next fastest growing demographic is the over 55 crowd, which has a growth rate of 194%. The core of the Facebook audience, the 25-34 year old group is still doubling every six months. The largest demographic concentration, the college crowd of 18-24 year olds, is down from 54% six months ago to 41%. Don’t discount this though as Facebook currently has 350 million active daily users, which is people that actually login and use Facebook on a daily basis; 41% is still about 143 million of these active users of Facebook. So yes with growth like that it does look like it’s here to stay! Well why don’t you just jump right in then, get yourself a Facebook page and get your brand connected with these millions of people? Maybe some of you have had a go and found that hey it’s just not that easy. For a start which page should you set up… a Fan page, Group page or Friends profile?? For a start a friends page is against Facebook policy for a business but Groups and Fan pages are OK.
OK so we’ve narrowed it down to Groups and Fan pages, which one should we go for? Well, a groups page is not going to show up in your members newsfeed, they will actually have to click through to it on the left hand side of their page to get to your information, which is a BIG negative. However you can invite people to become members of your group and grow your members base this way as opposed to a Fan page where you cannot invite people to become fans. Still, the fact they can’t see you in their newsfeed means they are very unlikely to be kept up to date and join your conversation. Fan pages are easier to search for than Groups as fan pages are a public profile that is visible to unregistered people and thus indexed by external search engines like Google, Groups are not. Pages are therefore generally better for long-term relationships with your fans, readers or customers. 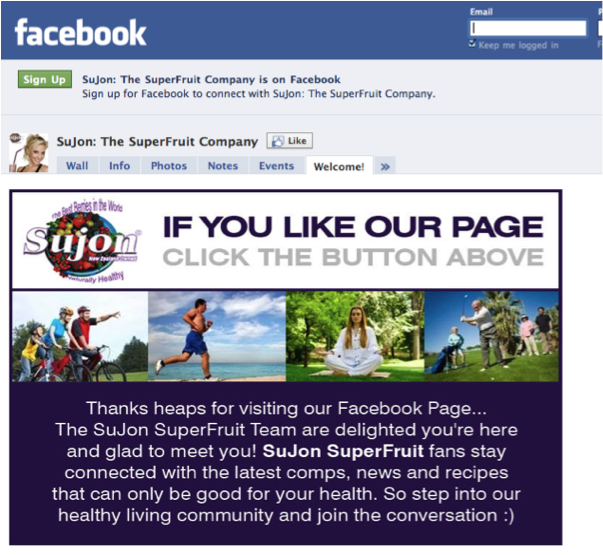 So, I suggest that a Fan Page is the way to go for a business. Be warned, ‘just because everyone else is doing it,’ doesn’t necessarily mean that it will be good for your brand. In order to create a successful fan page you need to ask yourself – ‘What does your company really want to achieve on Facebook’? This answer will give you an idea of how to go about achieving it with the assistance of a fan page. Ok, so if you’ve decided a fan page is a good idea then how are you going to get fans? This is a very good question and requires a good understanding of your audience – your target market; what do they want to converse about that is related to your brand? What value can you give them? A comprehensive customer database, if you have one can be one great way to start building your fan base. Striving to have lots of fans should not be the objective; the key is to have a page with a loyal fan base – fans that will actually interact with your brand. 10 fans that interact on your page are worth more than 10,000 fans and no interaction! Remember, it takes time to build a good loyal following. Red Bull has incorporated the use of a live Twitter feed. 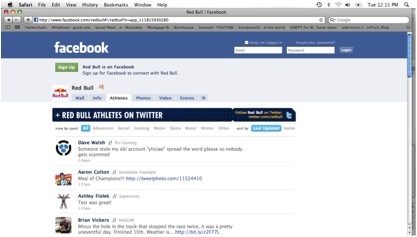 This is not just of their tweets but of all those Red Bull athletes that are on Twitter. This is a great way to create engaging content by feeding a variety of conversations into your Facebook Fan Page. Use plenty of great imagery and videos to tell their story. Hopefully this article has given you some insight into how facebook pages could become an essential tool within your Social Media Marketing Plan. Next post: Is a Website Necessary For Your Business?